The store will be located in northern Bismarck near Highway 83. Cash Wise Food & Drug will soon open a second Bismarck store, KX News reports. Rumors of a second Cash Wise location have long circulated, from replacing Kmart to a store in Mandan. Up until now, these rumors have proven to be just that. The store will be located at the intersection of Ottawa Street and 43rd Avenue, just west of Highway 83 and near the new Ace Hardware store. It will feature a gas station and car wash, along with a Caribou Coffee drive-through. Cash Wise’s parent, Minnesota-based Coborns, also locally owns Captain Jacks Liquor Land and Bill’s Liquor. The original Bismarck store originated as Holiday Plus Warehouse, which was the grocery division of Holiday Companies. It held a soft opening on July 7, 1982 and grand opening July 21. The store added 17,000 square feet to its original 40,000 just the following year. In or around 1990, Coborn’s purchased the local store and re-branded it “Cash Wise.” From 1994-1996, the store temporarily reverted back to Holiday Companies, as SuperFair Foods. 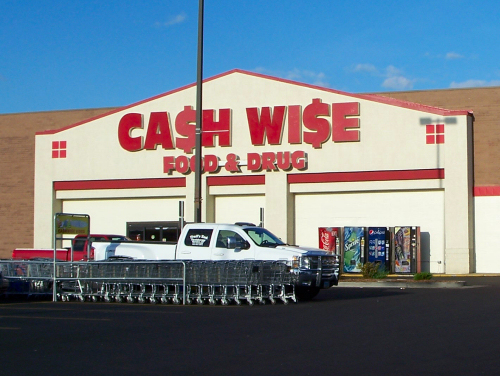 It resumed operations as Cash Wise in 1996. Cash Wise completed minor renovation in 2007, which included the addition of Little Dukes convenience store. Another, more significant, renovation was completed in 2017 that included a new exterior facade and a new checkout and bagging system.